‘If I leave the BJP now, will the Congress give me ticket?’ BJP MPs are wondering. The grand success of the opposition unity rally organised by West Bengal chief minister Mamata Banerjee in Kolkata, attended by leaders of more than 20 regional and national parties, has left the Bharatiya Janata Party (BJP) cadre demoralised. The party’s workers are increasingly growing sceptical about the bravado of Prime Minister Narendra Modi and party president Amit Shah. My private conversations with BJP MPs in Delhi, and interactions with some leaders in Chhattisgarh and party MLAs and aspiring candidates in Maharashtra show that they are not certain about the party’s showing in May. There is anxiety and panic among the BJP’s leadership on the ground. The party leaders who were confident that the Congress and its president Rahul Gandhi cannot rise from the ashes of the 2014 defeat are now worried about their own poll prospects. They are seeking answers to a variety of questions: “Should I seek re-election? What are the chances of winning? But will I get ticket in the first place? If I leave the BJP now, will the Congress give me ticket? Has Modi effect started fading rapidly? Just about two years ago, the same leaders were confident about the BJP winning every election, about Narendra Modi’s charisma, Amit Shah’s fabulous strategies, the RSS’s network, the party’s famed ‘panna pramukhs’ at the booth level, and its funding plans. Now their anxiety is a result of a fear that the BJP’s tally could fall below 200, or even below 160 in the Lok Sabha. In such a situation, will Narendra Modi be the PM, they ask. Can that Mr X build a new NDA and which parties will come with the BJP, they worry. and the party’s stand on triple talaq have not managed to impress people much. However, there is a widely-held view that the anti-Muslim sentiment is still strong and the polarisation of voters can be achieved, at least in north India. 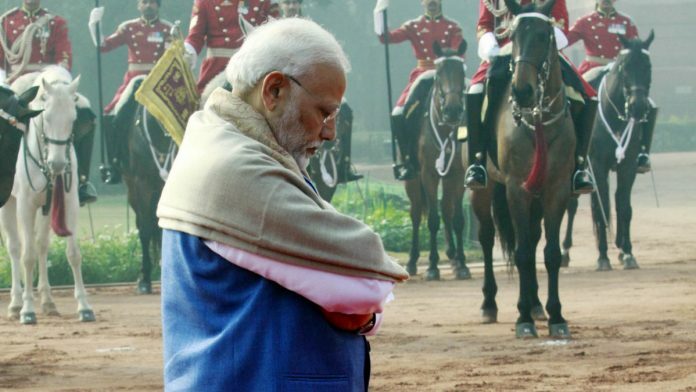 There is also relief among some BJP ticket seekers that the proposed ‘mahagatbandhan’ has failed to take off formally and there is no ‘consensus candidate’ for the PM’s job and that Modi remains ‘numero uno’. In the absence of a challenger, Modi, they believe, will swing the electorate in his favour. The opposition camp too is anxious and uncertain but the shift in the mood is more profound in the BJP cadre, which was overoptimistic even a year ago. It has reached the point where speculation by political experts begins. 1. The BJP will be the single largest party and the President will be obliged to call Narendra Modi to form government. Once he is called, he can ‘deal’ with new or old partners to take the figure to 275+ seats. After all Atal Bihari Vajpayee too had 182 seats, both in 1998 and 1999, and he could work out the National Democratic Alliance. If Vajpayee can, Modi surely will! He can manage to win the confidence vote and then the alliance will be streamlined in next six months. 2. The second scenario is, the BJP will be forced to change the leadership, because the electorate would not repose full faith in Modi. So other names like Nitin Gadkari, Rajnath Singh are tossed. But there appears no confidence among the cadres that these leaders could win friends. 3. In the absence of a working majority in the Lok Sabha, the President will be forced to call on the second-largest combine from the opposition to try and form the government. Then, there would be a scramble for power. Names of various potential candidates, from Mamata Banerjee to Mayawati to Sharad Pawar to the non-controversial Naveen Patnaik to Chandrababu Naidu are mentioned, but with little enthusiasm. 4. All of them feel that the Congress’s performance will improve considerably, but it won’t be enough to demand the top post. In any case, there are no bright chances for Rahul Gandhi to emerge as a consensus leader because all these parties have legacy of anti-Congressism. Some feel that even if there is dramatic improvement in the Congress’s numbers, Rahul would not pick up the gauntlet. 5. This is a long shot: There is a strange feeling that Pranab Mukherjee or even Manmohan Singh will be brought in, as they seem to have the least negatives. Even the RSS would not mind Pranab Mukherjee, they argue. 6. Another assessment of very few, but important leaders, is that all speculation is worthless because Modi will win close to 250 seats and then the question of any challenge to him or to the BJP will cease to exist. 7. Then the real question: What will anyone do in the next five years? Will the instability lead to mid-term polls, bringing back the ‘strong leadership’ of Modi? Modi supporters are still confident that he is here to stay till 2024 and his haters are sure he will be cut to size by the electorate. There is neither a consensus among astrologers on how stars will align nor among political commentators and pollsters (advisers) on what voters feel and what they will do once they face the EVM. The author is a former editor and Congress member of Rajya Sabha. Week after week I wonder why Ketkar writes at all…there is no content but just some imaginations and hallucinations if not plain non sense. Review his last 15-20 articles and you will find that he is simply obsessed with the idea that Modi will be defeated and though not very confident, Rahul will be th next PM in May 2019. One may not like Modi but one cannot be paranoid about it. Voters will decide in their best judgement. Ketkar should write on what congress will do if voted to power and why people should vote for congress rather than just attacking Modi. Of course, writing stories and inventing canards is much easier. Hopefully, Ketkar understands and appreciates my comments. Even the most ardent supporters of BJP in UP agree that both Modi and Yogi have failed. Shri Ketkar is a perfect example of why from being one of the pillars of democracy, media is now not taken seriously. Here is a person who was a journalist for most part of his life and now has become a politician. Quite obviously during his journalistic career he would not have been independent and would have been completely biased in favour of his ideological leanings. Now that is not how an honest and independent journalist should conduct himself. Shame on Shri Ketkar for debasing what was once a noble profession. Purely, a baised article. Rally was success, seriously u think Indians are fool. Time will show but one thing is clear today all other parties have to come together shows strength and power of MODI. The parties who has opposite ideology on all issues (religion, development, secularism,reservation) till date coming together just to be in power. They aren’t bother about anything specific then to be in power to make money in all possible ways. Put simply, the majority of Indians want Modi back bcoz he will only able to give stable and non corrupt government. An reporter who became Rajya Sabha member on Congress ticket writing this article ….such a waste of thePrint’s space and even ethically wrong. Ask him to prove it. Next government will be non BJP, which will fall before completing term. On re-election, Congress will emerge as largest party and the subsequent government will be stable. Irrespective of that whether that government will be good or useless. The way U P and Yogi’s push for cow protection is working; I have a hunch that BJP may remain in two figures in 2019 elections. .Modi has been known for his lies and hatred mongering. The Loya case; if it gathers momentum , will be a death knell on both the top leaders. Rafel has not died down.The only thing in favour of BJP is that Congress has not relented in accepting a lesser role. They are seeking personal glory.We still have two months , and Modi is being sucked by the quagmire he and his cronies have created for BJP .Gadkari is the name which may find much greater favour with the educated masses. Paid Media propaganda to save the CORRUPT. LOOKING AT THE PHOTO cruckedly CHOSEN BY the print , also tells the REAL STORY behind the article. Ha ha ha . Pranasmita Mukherjee? ??? Since when have ex Presidents become eligible for PM post. Dudewa… lolwa…. We will have a stable, progressive government in May. The future of 1.3 billion Indians is at stake. It should make good use of its mandate. On a lighter note, if we don’t raise our game, forget the dragon, Bangladesh will surge past us. Mr Kerker, so you sometimes read the stuff you write? Are you suggesting that the Bengal rally is a successs? In whose view, the rag tag leaders who attended, the large cross section of media, the Indian masses or as I suspect only you. थोरा तो balance रखो। I believe you are senior journalist and your reporting should reflect that. I suggest pl watch Kumar Ketkar on TV debate. His comments are completely biased towards Congress. This is also one of the fake media article. While it is natural for regional parties to stake claim for PM post should the mahagathbandh win, if some VJP members are planning to jump ship it is their choice. The guys who will leave are certainly those who have to ask themselves what they have done for their respective constituencies that they merit a ticket in 2019. Those who have utilized their MP status to make some lucre for their personal gain will be left out. The Congressay welcome them but assured tickets is a big nono. BJP will split after the elections. Mayawati will be the next PM. Rahul Gandhi will propose her name as the PM because others won’t accept his name as the PM. Modi will take a sabbatical from active politics and pen down a collection of his dreamy speeches, plus deliver more dreamy speeches. Amit shah will join his son in money-multiplying business. Jaitley will concentrate on his health issues. Ravi Shankar Prasad will roam hither and thither. Hindutva brigade will go back to barracks. RSS will return to its harmless thesis which it started in 1925 on what is Hindu rashtra, why the whole world is against Hindu rashtra, how to build Hindu rashtra (from a scratch). This article itself is written out of fear of NaMo. First four words in this article tell you that this is written by a paid presstitute. “Grand success of opposition rally”? Dude what are you smoking? Sharad Yadav was bashing Bofors scam in that rally. Then he had to be reminded that they are not there for Bofors scam. After selling himself out to the corrupt relics of the dynasty and showing his new loyalty repeatedly, why does he have to have “private conversations with BJP MPs”? Awww !! A good bhakt. Still can’t see the bad situation to BJP is in. After May even if opposition forms the government Mr Giri will be in denial state that Modi ji lost.